Algaliv - Kenya Biologics Ltd.
ALGALIV is a concentrated solution of a natural extract of seaweed (Ascophyllum nodosum) and phosphorus, potassium and microelements. The seaweed extract is rich in plant growth hormones such as cytokinins, gibberellins and auxins, and natural organic molecules including betaines, manitol, polysaccharides and amino acids. When applied to growing crop at the correct time, ALGALIV provides a localized increase in hormone levels to stimulate the corp’s metabolism and nutrient uptake. ALGALIV is recommended for the stimulation of the general crop metabolism. Application of ALGALIV results in better root development, more vigorous growth, increased resistance to disease and pathogenic insects and reduced frost damage. Composition is subject to changes according to local regulations applicable to such products. 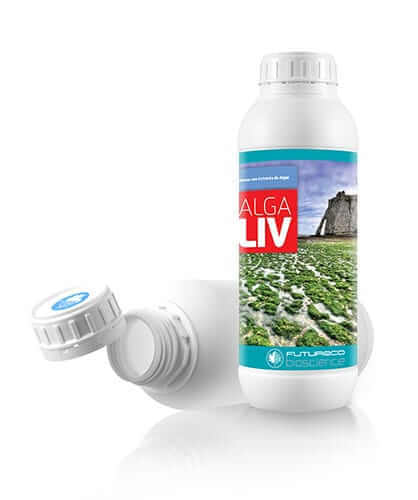 ALGALIV can be used at any stage of vegetative crop, applied in foliar spraying or diluted in irrigation water. Start applications two or three weeks after transplantation. Repeat at 15 – 20 days intervals as needed. Use sufficient water to ensure thorough coverage. ALGALIV is stable for at least three years since manufacturing date. Store in the closed original container in a cool, ventilated area. DO NOT store for prolonged periods in direct sunlight. Keep away from food, drink and animal feed. Keep out of the reach of children. Do not mix with products containing calcium or magnesium. ALGALIV is compatible with most pesticides and fertilizers. For application with plant protection products follow pesticide label directions and make jar test for compatibility. Composition is subject to change according to local regulations of such products. Tomato, pepper, cucumber 250 2.5 – 3 First application 20 days after transplantation and repeat at two weeks interval. Melon, watermelon, zucchini 200 2 – 3 Apply two weeks after transplantation and repeat at 15 days intervals. Lettuce, cabbage, strawberry 250 2 – 3 Apply two weeks after transplantation and repeat at 15 days intervals. Orange, mandarin and other fruit trees 250 5 Apply during vegetative growth and flowering. Potato, beans, blueberries 250-500 3 – 5 Distribute 3-4 applications throughout crop cycle.